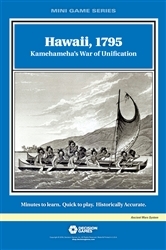 Hawaii, 1795: Kamehameha's War of Unification. Skirmishes, raids, and abortive diplomacy had divided the Hawaiian Islands from one another. In 1795, Kamehameha unified the big island of Hawaii and set out to bring the other islands under one high king. 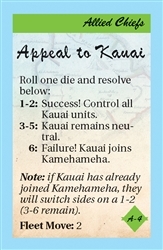 This is a two-player game of Kamehameha’s campaign of unification. 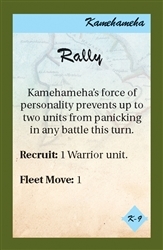 One player controls the forces of Kamehameha, the other commands the allied chiefs of Oahu and Maui. Movement carries armies along the Hawaiian chain, followed by tactical combat for control of each island. 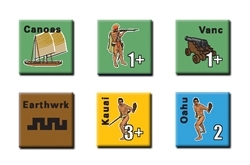 Counters represent warriors, musketeers, pikemen, elite guards, cannons, and canoes. 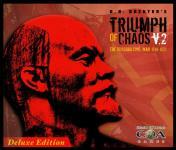 The game mechanics are based on the Ancient Wars system. 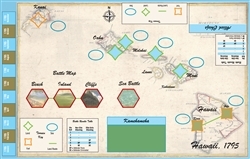 Cards generate special events, such as intervention by the forces of Kauai, the acquisition of cannons from European powers, or granting one player tactical advantages or additional forces.